You know that chocolate sauce that you buy at stores and pour on ice cream and it turns into hard shell? It's magical, right? And now, I have the magic! When I got my paws on the new cookbook, Big Gay Ice Cream by Bryan Petroff and Douglas Quint, I thought I was going to end up making ice cream, but I stopped at the chapter with the toppings, and got stuck there for a while. First, I made the Whisky Walnuts, then I made the Magical Shell. I've seen recipes for Magic Shell clones online, but they all seem to use coconut oil, but I don't like coconut, so I've never been tempted to try them. this one uses olive oil, but it tastes like all chocolate. Here's the thing, though. The recipe for Magical Shell in the book calls for THREE pounds of chocolate. It makes a LOT of syrup. If you're making it for a party, maybe you need that much. But if you're making it for home use, maybe you want to back off a bit and make a more sane amount. I cut the recipe waaaaay back, and then re-thought it and upped the recipe by a little bit, which is what you have here. This adaptation is still a fairly small amount, but it's enough to let you decide if you want to make more, and then you can double or triple or quadruple the amounts. According to the book, this keeps at room temperature for up to 6 weeks, but it's so simple to make, I'd rather make a smaller amount rather than have a jug of it sitting around. Combine the olive oil and chocolate in a heavy-bottomed pan. Cook on low heat, stirring, until the chocolate melts and the mixture is smooth. Add the salt and continue stirring until the salt is completely incorporated. Remove it from the heat and let it cool to room temperature before pouring or drizzling onto ice cream. If you want to make a large quantity, the original amounts were 3 3/4 cups olive oil, 3 pounds bittersweet chocolate, and 4 teaspoons salt. This can be stored in an airtight container for up to 6 weeks. If it becomes too hard to pour, you can gently warm it by putting the container in warm water and stirring until it's pourable again. 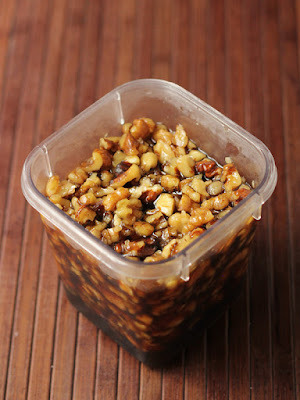 And just to tease you a bit, here are the Whisky Walnuts. They're fantastic on ice cream, and I can just imagine how wonderful they'd be on top of cheesecake. Oh, yum! For more about the book, check out my review on Munching on Books.